Often known as the Frogdog, Bouledogue Francais, Bat Ears, Boule-Dogue Francais or Frenchie, the French bulldog is a dog known for its funny personality and mini Bulldog appearance. Generally, these dogs are not snappy or noisy and they have become a popular dog for individuals looking for a medium-sized dog that is easy to care for. French bulldogs also make great companions for the entire family. While the dogs are known for their bat-like ears, originally breeders preferred “rose” or dropped ears. However, the bat ears have become the hallmark look for modern French bulldogs today. The French Bulldog has a long, interesting history. These bulldogs are thought to descend in part from English bulldogs, particularly from a toy variety of English bulldog, which were very popular in the mid-1800s in England. The smaller bulldogs lost their popularity among the English, and large numbers of these smaller dogs were sent to France. The small toy bulldogs were crossed with many different breeds and became popular among wealth city women and rural landowners in France. From the start of the Frenchie, the dogs were bred to be watchdogs and companions. Soon the bat ears became prevalent among these small bulldogs and are a defining mark of modern French bulldogs today. In 1897, the French Bulldog Club of America was founded and was the first and oldest organization that was devoted to this particular breed of bulldogs. This organization held a specialty show at the Waldorf-Astoria in New York in 1897 and was the first show for these diminutive bulldogs. After the big show, the French bulldog soared in popularity across the United States. One dog that was thought to contribute to the fine stock of French bulldogs in America was Ch. Nellcote Gaminn, a dog that was imported into the United States back in 1904. In 1902, England finally came up with a club devoted to the breed, the French Bulldog Club of England. However, it wasn’t until 1906 that The London’s Kennel Club actually approved the breed officially. Originally, the Kennel Club in England called the breed the Bouledogue Francais, but in 1912, the name was officially changed to the French bulldog. The French bulldog is sturdy and small and features a short, pug nose and bat-like, large ears. They have a flat head with a rounded forehead, although their head isn’t as large as the English Bulldog’s head. Their soft, shiny, short coat comes in a variety of different colors, including brindle, cream and fawn. Frenchies with a brindle coat may have a brindle pied, tiger brindle or black brindle coat. French bulldogs have round, large eyes, an underbite and a tail that may be a cork-screw or completely straight. They have a square shape, but are generally a bit wider at their shoulders than at their haunches. These small dogs generally grow up to stand about 12 inches at their shoulder. When full grown, they weigh from 15-18 pounds, and dogs heavier than 28 pounds are disqualified by the AKC standards in the show ring. For companion dogs, there’s no weight requirement, but in most cases it’s best for this breed to stick at around 28 pounds to avoid health problems. Frenchies make excellent companion dogs because they are usually well behaved, funny and they adore being around people. They crave attention and enjoy being with their owners. Their small size makes them an excellent dog to have indoors, even in small apartments. These mischievous, fun loving dogs love to be the center of attention, and while they enjoy playing during the day, they enjoy cuddling and relaxing with their owners too. Since they like attention, they shouldn’t be left by themselves for long time periods, since they may develop problems with separation anxiety. 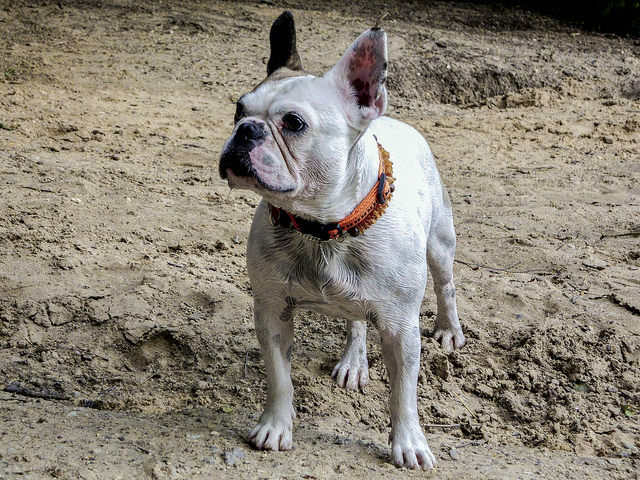 While the French bulldog is a lot of fun, they can be stubborn and a challenge to train. When training this breed, it is important to have short training sessions and a routine that varies. French bulldogs do require some activity each day, but two or three 15-minute walks are usually enough. Since they are prone to heat stroke, owners must be careful when exercising these dogs in the hot summer months. They don’t need a lot of space or activity, so they are great dogs for people who do not have a lot of outdoor space. Since the French bulldog has a short coat, they are easy to groom. The coat should be brushed once a week to ensure that the coat looks healthy and shiny. Frenchies do require regular nail clippings, so it is important to start handling the feet of a French bulldog while he is young to get him used to monthly clippings. Regular nail clippings are necessary, since these dogs don’t naturally wear down their nails. Since French bulldogs can easily develop halitosis problems, it is essential to ensure their teeth are brushed several times each week. French bulldogs were bred mainly to be companion dogs, so they have not taken on many working roles through the years. However, several Frenchies have appeared on television in shows such as Bored to Death and the popular comedy, Modern Family. The French bulldog generally lives to be 10-12 years old. Because the French bulldog has a compacted airway, sometimes they develop problems regulating their body temperature, which makes it difficult for Frenchies to endure temperature extremes. This breed is considered a brachycephalic breed, and their snub nose makes it difficult for these dogs to breathe if they are stressed or hot. For this reason, many commercial airlines refuse to carry these dogs in the cargo space, since the temperature in the cargo space of a plane can become rather warm. Various spinal and back diseases often affect French bulldogs as well, and they probably occur because these dogs were bred from dwarf bulldogs. Patellar luxation, which is a slipping of the kneecap, is a common health problem that these dogs experience as well. Frenchies often deal with eye problems, such as glaucoma, cherry eye, corneal ulcers, juvenile cataracts and retinal fold dysplasia are eye conditions that may affect this breed.